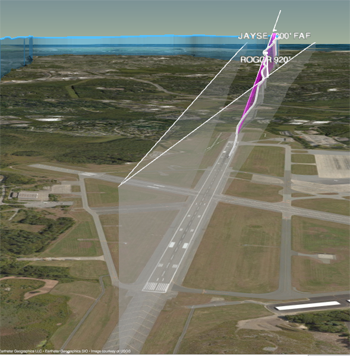 We are excited to start the public beta of our new 3D Views, based on Cesium. Why a new 3D? What is Cesium? The initial trigger for the change was that our existing 3D is based on the Google Earth plugin, which is being phased out by Google (for the curious, read this ). The Google Earth plugin is already unsupported in Chrome, and will be discontinued by Google this December. We started to look for an alternative, evaluated Cesium we realized that it has many advantages. We have been working on the integration for a few months now, with collaboration from the Cesium people – see our demo page on their website. It’s a great team to work with. –– iPad – great news for many of you! No plugin! No need to install anything, and the browser will not ask you to approve its use. The main caveat: it requires a relatively modern hardware. It will run nicely on a 2-year-old PC or Mac and on an iPad Air 2. If you have an old computer or an old iPad – regrettably, the new 3D will probably not run so well; we continue working with Cesium on performance improvements. Another issue: currently there are no 3D buildings. Other than that – it works great! The new 3D works great for us and for our pre-beta testers. Bear in mind that it’s a new technology, though, not as mature as the Google Earth plugin. To start using the new 3D, click the ꩄbeta3D checkbox on the top-left on the screen. 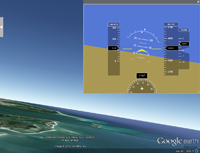 If it does not work well for you, you can get off the beta and continue using 3D with the Google Earth plugin, or stay on the beta and use the 2D only. And – IMPORTANT – let us know, please! We are eagerly awaiting your feedback! Tell us how it works for you – the good, the bad, and the odd. Use email, or you can use the feedback link on the top-left of the screen. We always reply. For those of you who share their flights with others – we have a new and improved way to share: quicker, and personalized. It has a thumbnail image of the shared flight – a popular request. The other day I flew with non-pilot friends to Nantucket. It was a perfect flying day, and after we left Boston’s class bravo I let my friend in the right seat drive most of the way. He was thrilled. Back home, I sent him an email with the flight’s share. 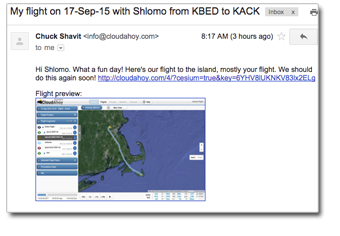 The new share’s email feature includes a thumbnail of the flight in the email message, like the example on the right. My friend could click the thumbnail or the link in the email and relive the flight. We also made it easier to view a flight share, even for non-pilots; this is what my friend saw when he clicked the thumbnail in his email. In this share I was using our new Cesium-based 3D rendering, which, at the time of writing this post, is a sneak preview of the tech to come. How to share a flight? When you debrief a flight, note the new button on top. Post the flight on Facebook (example on the right) and Twitter. Send an email with the flight link and a thumbnail to anyone. Details here. BTW, you can also share a flight from the Flights tab. 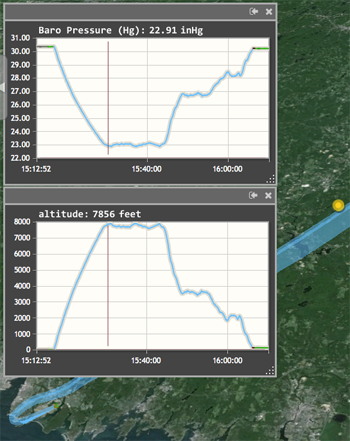 We collaborated with ForeFlight, and as of today we use the measured AHRS data (pitch & roll) as captured by Stratus 2 and 2S. How do I import my Stratus AHRS data into CloudAhoy? 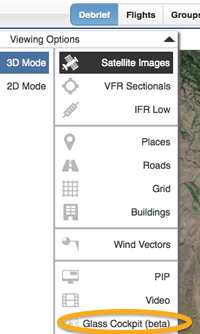 You need to download and import the KML file from your ForeFlight account on the web. See 2. Import from ForeFlight on the Web. Note: if you import your ForeFlight flight track directly from ForeFlight’s iPad app, AHRS data will not be included. How does it affect my debrief? When you display cockpit view, and when you display glass gauges, the measured pitch & roll are displayed. 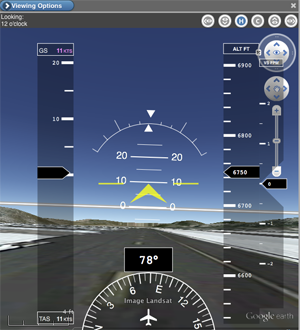 The screenshot on the right shows cockpit view of a taxiing taildragger, with 10° pitch. What if I don’t have an AHRS? Then we display the computed pitch and roll, like we always did. It’s very close to the measured pitch & roll in most cases. 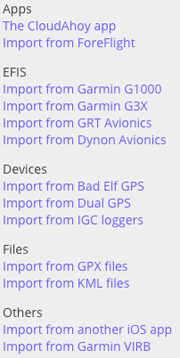 I imported data from an EFIS (like Garmin G1000). Which pitch & roll is displayed? CloudAhoy will use the measured AHRS data from the EFIS. We support CSV file import from the following EFIS; click each link for instructions. Can I use the computed pitch & roll even if my flight data has AHRS data? Yes: Account tab > Use AHRS Data if Available > Off. This extends the list of supported devices and file formats (on the right). While many pilots use our free CloudAhoy apps on iOS and Android to log data, we see a trend towards importing from other sources. 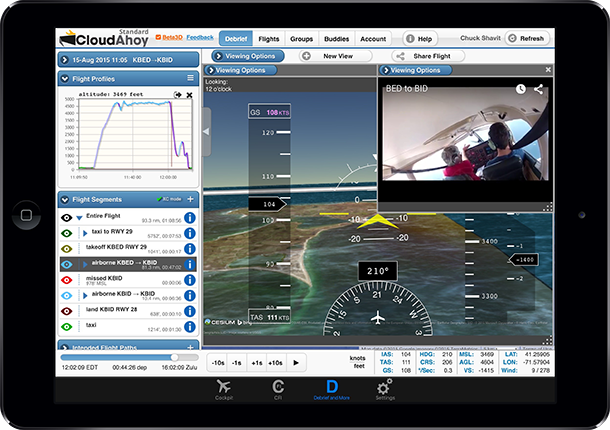 For example, our users log data with ForeFlight+Stratus and import it to CloudAhoy, or import rich avionics data from G1000’s data card. Importing data, as opposed to using our apps for logging, may have benefits. Please refer to our online help. We are excited to start the public beta testing of our new Universal Windows. To the users who tested the pre-beta versions – a big thank you! 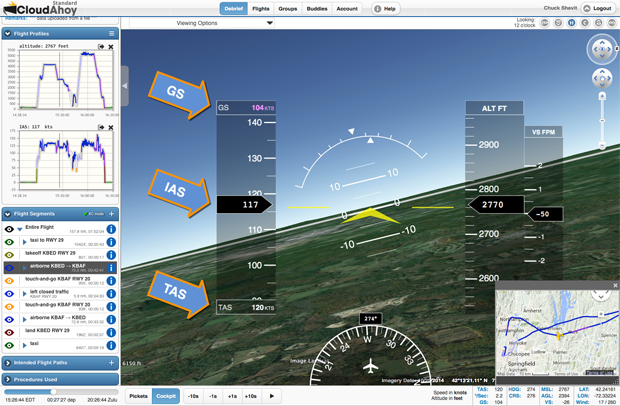 With Universal Windows you can open any number of windows, and display any view in each – 2D or 3D track, cockpit view, video, aviation charts, wind, etc. You can now add the glass gauges to any window, and in any size. To use the beta software, see this. It’s easy to join the beta program, and if something doesn’t work well it’s easy to revert back to the released software. Feedback of any kind will be highly appreciated! As usual, send feedback dev@CloudAhoy.com. – Mac: Safari and Firefox. The good news is that we are now in the process of developing full 3D capabilities for every computer/browser configuration. Yes, including the iPad! Coming soon – stay tuned. One of the benefits of using Bad Elf Pro+ is that it logs the barometric pressure – useful information especially if your cockpit is unpressurized. If you log your flight with Bad Elf Pro+ and import the data to CloudAhoy, you can now include the barometric pressure in your flight debriefs. The CloudAhoy screenshot on the right shows the barometric pressure in inches of mercury. It can also be displayed in millibars. Log the flight with Bad Elf Pro+. It’s a convenient alternative to logging with your iOS or Android app. 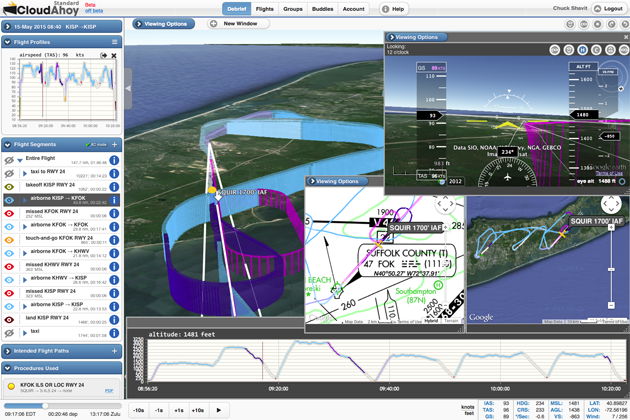 After landing, download the flight’s GPX file from the Bad Elf Pro+. Import the GPX file to CloudAhoy. Select “Barometric Pressure” from the profile menu; you can select the data in inHg or in millibars. Visiting Sun ‘n Fun 2015! 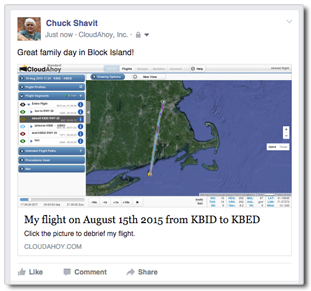 To meet up, email chuck@CloudAhoy.com, or call 781-269-1138. We do not have a booth this year, but I’ll be around and hope to meet many of you. The airspeed tape of our glass cockpit now include IAS and GS, in addition to TAS. Less than an hour after we published our previous blog post about the glass cockpit gauges, we started receiving emails requesting a display of the Indicated Airspeed (IAS) in addition to the True Airspeed (TAS). It’s available now. 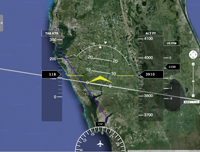 In the example below, IAS is 117 knots, ground speed (GS) is 104 knots and TAS is 120 knots. If your flight is imported from Garmin G1000 or Garmin G3X, the IAS number is the actual indicated airspeed that was displayed in flight. If you are logging the flight in a different way, we display a computed IAS. Note: the glass cockpit screenshot above was taken on a Macintosh. See this for its look on Windows and iPad. We started beta testing of our glass-cockpit-style gauges, and would like to invite you to try them. To add the gauges to your debrief, select Glass Cockpit from the Viewing Options menu. You do not need AHRS information to display the glass gauges. CloudAhoy displays calculated attitude, rather than the measured attitude. 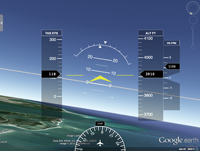 You don’t need to wait for your next flight; the glass gauges beta can be used when debriefing any of you past flights. – In 2D mode, and in 3D on the Mac, the gauges are displayed over the main window (A and C, below). 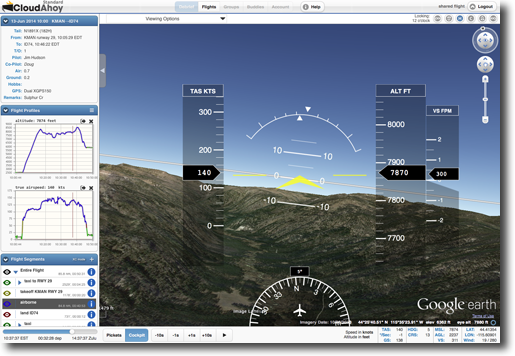 – In 3D on Windows, the gauges are shown in a resizable/movable window (B). Our current implementation includes an airspeed tape, attitude indicator, altitude tape, vertical speed tape, and a heading indicator. As always, your feedback is very welcomed. Please let us know (info@CloudAhoy.com) how the gauges work for you. A new addition to CloudAhoy – a comprehensive Help. Click this to check it out. We have collected our existing how-to articles, added many more, created some videos – and made it all accessible by clicking the Help button (see below). This is a work in progress. We plan to continue to add more information and tutorials. One of the insights we brought back with us from Oshkosh in August was the realization that many of our users were not aware of important existing capabilities. This central repository for tutorials and help is a direct result of that realization. Sharing help topics: if you want to send a link to a specific help topic, or post it in your blog, use the button at the top of the page and copy the link. Invoking the help from CloudAhoy (app and web): click the Help button located right of the tab list. As always, your feedback is very welcomed. 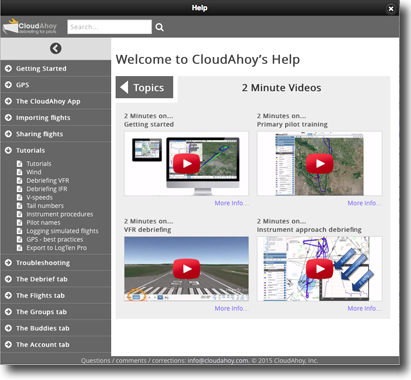 Let us know (info@CloudAhoy.com) how this on-line help works for you, and send us your wish-list for improving and expanding it.